MINNEAPOLIS — When Robert Covington, Dario Saric and Jerryd Bayless walked into their hotel rooms in Minnesota, they found appropriate gifts from Timberwolves All-Star Karl-Anthony Towns: winter coats. After the overnight temperature dropped to 7 degrees, the newest members of the team by way of the Jimmy Butler trade with Philadelphia appreciated the welcome from Minnesota’s best player. Butler’s awkward and drawn-out departure created an icy atmosphere around the organization, but now that the deal is finally done, the Wolves have begun trying to warm the atmosphere back up. 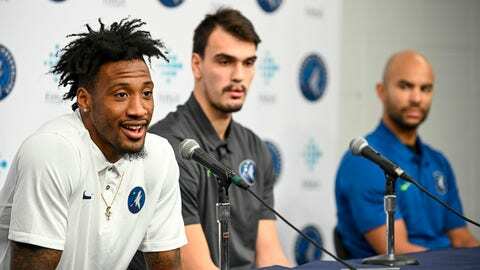 “We can’t wait to get on the court, put on that jersey and put it on for this city,” Covington said at a news conference inside Target Center on Tuesday afternoon that carried just a bit less buzz than Butler’s open-to-the-public introduction at the Mall of America less than 17 months ago. As Butler formally joined the 76ers , the Wolves pivoted forward after a pressure-relieving win over Brooklyn on Monday night following an 0-5 road trip. Neither Covington nor Saric played against the Nets, but they’re on track to take the floor on Wednesday night against New Orleans. Bayless is injured, rehabilitating a hyperextended right knee, and with a glut of point guards on the roster he’s not expected to see playing time even once he’s healthy. Both Covington and Saric were starters for the Sixers, who finished third in the Eastern Conference last season at 52-30. As for whether the Timberwolves could be better without Butler, the four-time All-Star with exceptional ability on both ends on the court, Thibodeau demurred. “We have to focus on who’s here. We think we have a good, young nucleus, and we have to build off of that,” Thibodeau said. Covington is the centerpiece of the package. The 27-year-old, who went undrafted out of Tennessee State and began in the NBA with Houston in the 2013-14 season, has career averages of 12.6 points, 5.5 rebounds and 1.6 assists per game with a 35.9 shooting percentage from 3-point range. The 6-foot-9 Covington was an All-Defensive First Team pick last season with a career-most 315 deflections and a defensive rating of 99.0 that led all forwards in the league with at least 30 minutes per game. He was ninth in the NBA in steals with an average of 1.7 per game. That’s the area where he’ll help the Timberwolves the most, the area that Butler was also acquired to help improve. The 24-year-old Saric was named to the All-Rookie First Team in 2016-17. The native of Croatia has career averages of 13.5 points, 6.5 rebounds and 2.4 assists per game. He shot 39.3 percent from 3-point range last season. Covington will likely fill Butler’s starting spot. Thibodeau could move Taj Gibson to the second unit and keep Saric as a starter. The 6-foot-10 Saric, who was the 12th overall pick in the 2014 draft, is the classic “stretch four” with a power forward’s size and a small forward’s shot. He meshed well with Sixers center Joel Embiid, so Towns has the potential to similarly complement his game.